There are so many ways to celebrate a wedding today that one might face with quite a hard choice. However, it is good to have a wide range of options: this way you can always make sure that you have a plan B. The idea we are going to discuss today will by all means become one of the top ones on your list. Since we still have a couple of more sunny and warm weeks, it is reasonable to make use of them to the largest extent. Hence, it makes sense to do something outside and preferably at the water. 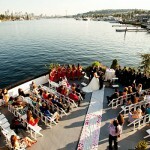 There are not so many ways to arrange a wedding which would include these two elements; the most exciting of them is definitely a ceremony on the deck of a boat. 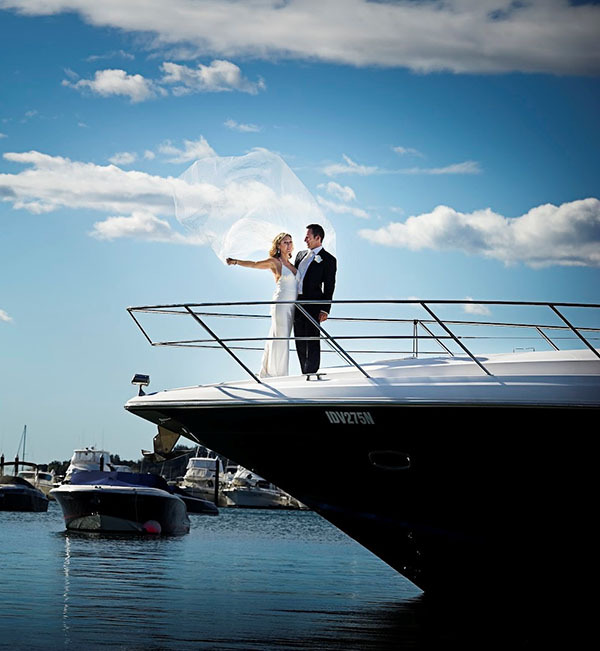 First of all, you have to decide whether you would like to have your wedding as a formal ceremony with lots of guests or just a peaceful and calm journey along the lake/sea/river with the two of you. In case you prefer the first option, be ready for a handful of things to do. First and foremost you ought to find a decent ship which will fit in all of your relatives and friends and also will speak to you in terms of style and design. Then you will have to make sure the administration of the ship provides you with all the necessary equipment, such as tables, chairs, some music equipment and other things required for a decent party. Otherwise, you will have to get it from somewhere else. Besides, the decoration part is still in place, so one has to meet up with the florist as well. Also, you will have to worry about the invitation letters, as these are the first hints of the coming holiday. To intrigue your guests, you can easily design your invitations in a marine theme. 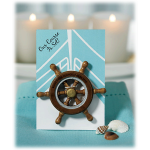 For instance, these loveliest turquoise cards with an anchor in the middle would fit in perfectly. Apart from the cards, one will also have to worry about the most important dessert of the ceremony – the wedding cake. 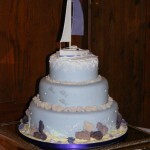 It is also recommended to go for a design that would be related to your ship theme. If you decide that the wedding today is a holiday for only two of you, no one is going to judge you. 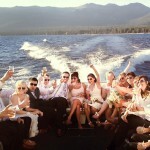 This is purely your choice and it is upon you to decide how to celebrate the big day. Hence, the idea to have a mini rip on a small boat should not scare you that much. Just imagine how romantic it is to stroll along the glistening surface of water along with your beloved one. You won’t be disturbed by any external noises and worries and will fall into complete harmony with nature. Plus, you can easily make a stop at the bank to have a picnic. 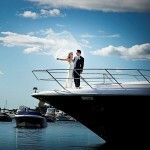 Whatever kind of a boat wedding you choose will define the complexity of the preparation process. Just remember that there is nothing impossible – keep chasing your dream and it will become true. It always does.